What is Tempeh? Tempeh is the most nutritious of soy foods. It has been a staple source of protein in Indonesia for several hundred years. It is an excellent replacement for animal protein. Tempeh is made by a natural culturing and controlled fermentation process that binds soybean particles into a cake form. The starter culture is rhizopus oligosporus. This is a type of filamentous form fungi, it is not a bacterial form. This mould is a beneficial fungus. The mould plays a critical role in “predigesting” a large portion of the soybeans’ protein, converting the protein into amino acids which makes for easy digestibility of tempeh. As the culture spores germinate they bind the soybeans together into compact white cakes. The result is a chunky cake of beans that delivers a mild, nutty flavour with a firm yet tender, meaty or chewy texture. The only limitation in using tempeh is one's imagination! Check out our recipes and tips for some interesting ways of incorporating tempeh into your diet. Why should I choose tempeh over other kinds of soyfoods? Henry’s Tempeh has several distinctive advantages or benefits over other kinds of soyfoods. Protein: Tempeh has twice (or more) the protein of tofu. Fibre: Tempeh is high in soluble or dietary fibre. Tofu has no fibre. Cultured: Tempeh is a cultured food, tofu is not. The culture is significant in that it “predigests” as much as half the soybean’s protein, converting it to amino acids during the culturing process, therefore making digestibility easier. How can I eat the tempeh? Normally, tempeh is eaten cooked. Tempeh can be marinated, grilled, grated, stir-fried, pan-fried, toasted, baked or steamed. Ingredients: organic soybeans Made close to home in Kitchener-Waterloo. Tempeh is the most nutritious of soy foods. It has been a staple source of protein in Indonesia for several hundred years. It is an excellent replacement for animal protein. Tempeh is made by a natural culturing and controlled fermentation process that binds soybean particles into a cake form. The starter culture is rhizopus oligosporus. This is a type of filamentous form fungi, it is not a bacterial form. This mould is a beneficial fungus. The mould plays a critical role in “predigesting” a large portion of the soybeans’ protein, converting the protein into amino acids which makes for easy digestibility of tempeh. As the culture spores germinate they bind the soybeans together into compact white cakes. The result is a chunky cake of beans that delivers a mild, nutty flavour with a firm yet tender, meaty or chewy texture. The only limitation in using tempeh is one's imagination! Check out our recipes and tips for some interesting ways of incorporating tempeh into your diet. Why should I choose tempeh over other kinds of soyfoods? 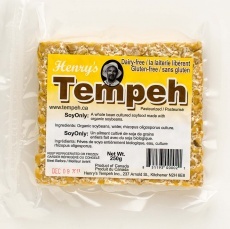 Henry’s Tempeh has several distinctive advantages or benefits over other kinds of soyfoods. Protein: Tempeh has twice (or more) the protein of tofu. Fibre: Tempeh is high in soluble or dietary fibre. Tofu has no fibre. Cultured: Tempeh is a cultured food, tofu is not. The culture is significant in that it “predigests” as much as half the soybean’s protein, converting it to amino acids during the culturing process, therefore making digestibility easier. How can I eat the tempeh? Normally, tempeh is eaten cooked. Tempeh can be marinated, grilled, grated, stir-fried, pan-fried, toasted, baked or steamed. Made close to home in Kitchener-Waterloo.